With horrifying levels of pollution in the water the picture postcard Olympic marina at Guanabara Bay has been inaugurated just four months ahead of the Rio Games. Rubbish, waste and worse are visible in the sea and on the nearby downtown Flamengo beach. "The promise to the population that they would be able to swim in the Guanabara Bay, and that millions of people would be able to use this for their leisure, has unhappily been broken," said Brazilian yachting federation president, Marco Aurelio, who did however congratulate efforts to improve the facility. 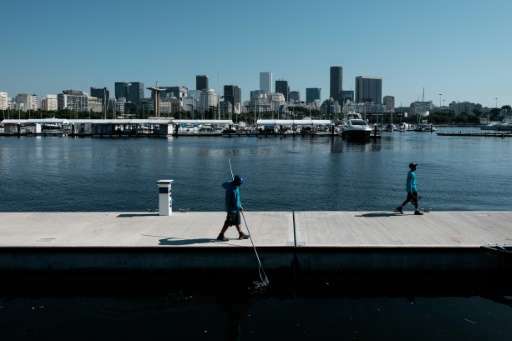 While workers struggled to finish pontoons and buildings and a sewer dumping detritus into the bay is still weeks away from being blocked, Rio Mayor Eduardo Paes and Brazil's sports minister Ricardo Leyser were present Thursday for the official opening. "This is not a failure!" insisted the mayor. "We have depolluted to 60 percent and we have targeted 80 percent," he said, explaining how $2.5 billion have been spent on a clean up campaign. "We are opening space up to the sea," he said, explaining this was not just for the Games but for the city's heritage. "But we the organisers will be blamed every time there's some rubbish. This is a challenge for Rio itself." The location in front of Sugarloaf mountain, a stone's throw from the centre of Rio in front of the verdant Santa Teresa neighbourhood, the Olympic sailing should showcase the city's astonishing beauty in August. And on Friday the marina has only been used by private yachts since 1982, plays host to an exhibition of the craft which will compete at the Games. AS part of the Olympic effort the marina has undergone a €17 million ($19.3 million) facelift and seen its holding capacity upgraded from 210 to 655 craft. "Happily the economic crisis has not affected the organisation of the Games," said the sports minister. "We were ahead of schedule and had private backing." But the water treatment facility is still spilling its contents into what some describe as an open sewer and nearby petro-chemical industry traffic adding a toxic twist to the cocktail still needs to be resolved.